A funny little snowman to add character to any Christmas tree. His hand knitted body is made from softest lambswool and finished with hand stitched detailing. Wrapped around his neck is a lovely vintage fabric scarf and on his head a little knitted hat. 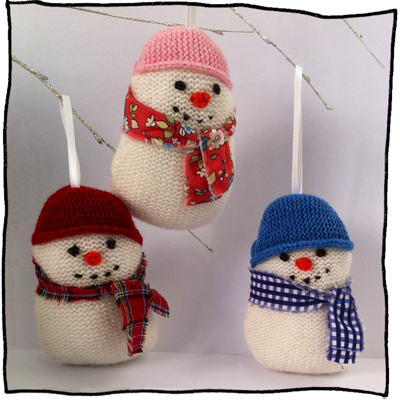 The snowman is available with either a blue, pink or red knitted hat and a choice of blue, pink or red fabrics for the scarf.